The last few years have been the most prolific period in Slam’s career. Performing dynamic sets at many leading festivals including Time Warp, Mayday, Bestival, Glade, Awakenings, Glastonbury, Monegros and T In The Park. They have also played at some of the world’s best clubs including the legendary Womb in Tokyo, Cocoon in Frankfurt, Rex in Paris and Berlin's infamous Watergate and Berghain. Their Soma Records label hit its 20th birthday in 2011, which is a great achievement in any industry never mind the fickle music business. In this prestigious year Slam were also nominated as the ‘Greatest Dance Act of All Time’ in the institutional UK Dance music magazine Mixmag. SOMA RECORDS: SLAM are the proud co-owners of Soma, which now in its 21st year, continues to be one of the world’s leading purveyors of cutting edge electronic music. 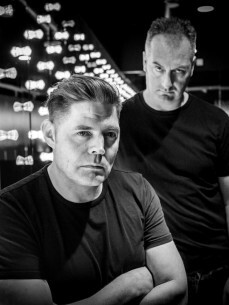 As well as introducing and developing many new acts and album projects, Soma’s recent releases have included singles and remixes from artists including The Black Dog, Adam Beyer, Joris Voorn, Silicone Soul, Gary Beck, Surgeon, Loco Dice, Mark Broom, Nick Curly, Matthias Tanzmann, Pan-Pot, Carl Craig, Radio Slave and Sebo K. Big names. Big tracks! Slam's latest release on Soma is 'Old School Jams for the New Republic'; a two track EP of powerful dancefloor burners. The first release 'City Destroyer', with its crisp electronic sound-scapes, secured club plays and support from the likes of Richie Hawtin, Adam Beyer and Laurent Garnier. Since then Paragraph has combined Slam’s love and talents for both Techno & House to great effect. Massive tracks like 'Hot Knives', 'Variance', 'We Doin’ This Again' and 'Room 2' have been working crowds the world over. Slam's 'Alliances' series, has also commenced on Paragraph with collaborations between Slam and their friends and peers. The first release was with Gary Beck and is soon to be followed by collabs with Pan-Pot & Italo Boyz. Their Return To Mono residency at Glasgow's Sub Club has also etched its way into the Paragraph label through the 'RTM Project'. This concentrates on the housier side of the duos productions.